Jewelry, of one type or another, is every woman’s melting point. What if that jewelry is decorated with delicate diamonds? Love at first sight and consequently, forever.Diamond bracelets have an individual character to them and we love how universally accepted accessory they are. We have three types of bracelets that make for a perfect accessory you can wear on a fancy dinner or a professional lunch. Diamond bangle bracelets are single or in pairs and have studded diamonds. They are infinite circles with no clasp which justifies the bangle feature of them. 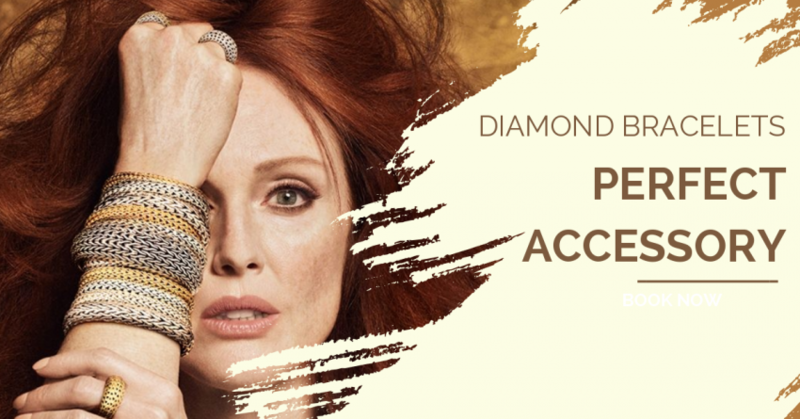 According to your personality, budget the purpose you are choosing the bracelet the diamonds may run throughout the circumference of the diamond bracelet or at alternative points with space for metal to give more attributes. A basic charm bracelet may significant meaning and is capable of customization for any woman with the idea and interest for it. Diamond charm bracelets close with clasps and can accommodate new charms. Either these charms or the bracelet or even all of them can be designed in diamonds, as per the budget allowance. A charm may be flowers, monuments, shapes, rings, musical instruments, numerals, alphabets, sporting equipments, etc. Whatever makes your heart flutter is the charm you should pick for your diamond bracelet. These are the typical form of bracelets that have no closing and designs on the top. Diamond formation on top of the bracelets vary according to the price and metals. You can choose titanium metal or rose gold polish for a truly unique bracelet and yet elegant.